It tuned out to be a great day at the Innisfail Show 'n Shine. 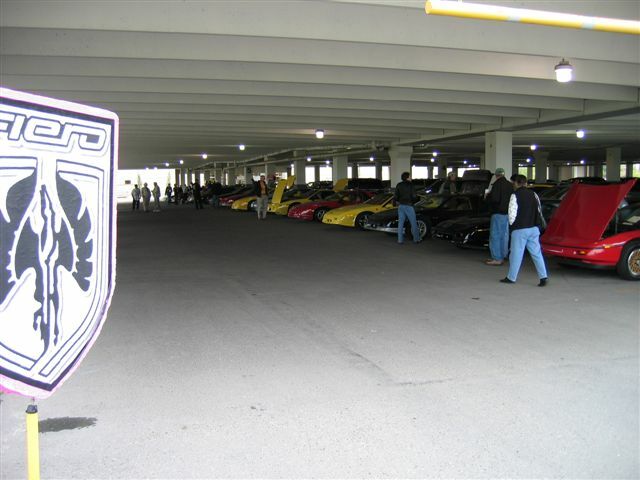 In among the 100's of cars was our group of just under a dozen Fieros. As usual, Troy Ritchie's black SBC equipped GT had the fastest time of 2.44 sec in the 100-foot drags. We had people as far as Winnipeg, Manitoba come down for this event, including some from Lethbridge, Saskatoon, Edmonton, and surrounding areas. The Show 'n Shine had 34 Fieros registered for trophies and door prizes with about 6 others that parked nearby to come see the event. Not bad for a first ever "Western Canada" Fiero Show. Maybe next year we can at least double that! Once the show came to a close, we went over to Hooter's to wind-down and finish off the day with some food and drinks. Monday followed up with a Fiero Run of 13 cars to Banff and surrounding areas. We had 4 cars participating. Lots of interest from other show-goers. We had 4 cars make the trip and tour the musems. We hope for better participation next year. We had over 25 cars meet in Red Deer with cars also from Edmonton, Calgary and Lethbridge. Many thanks to Troy Ritchie and Tony Almeida and their families for the great BBQ they had for us.